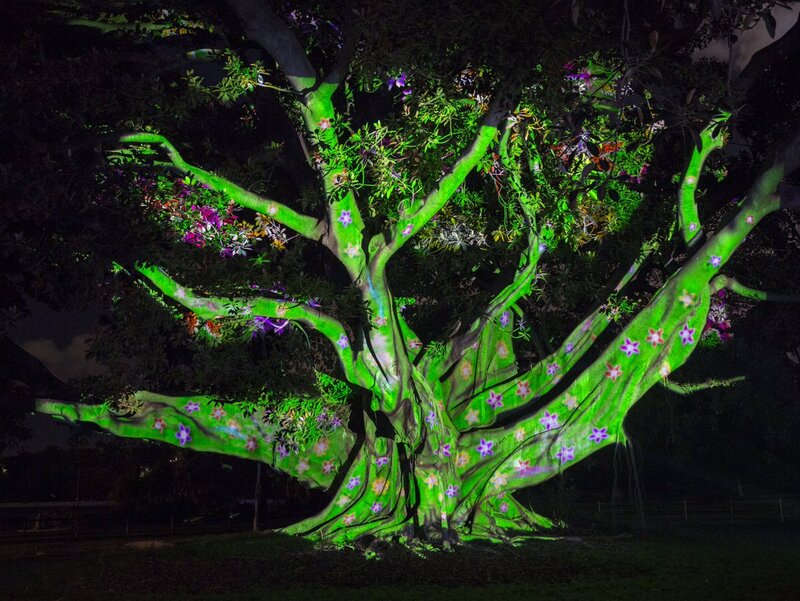 A collaboration and showcase between artists and collectives, young and old – where new developments in projection, lighting and sound technology enable them to use plants, rock walls, tree canopies and even the magnificent trunks of 100-year-old Ficuses, as organic canvases, the nexus perhaps, of art and botany. 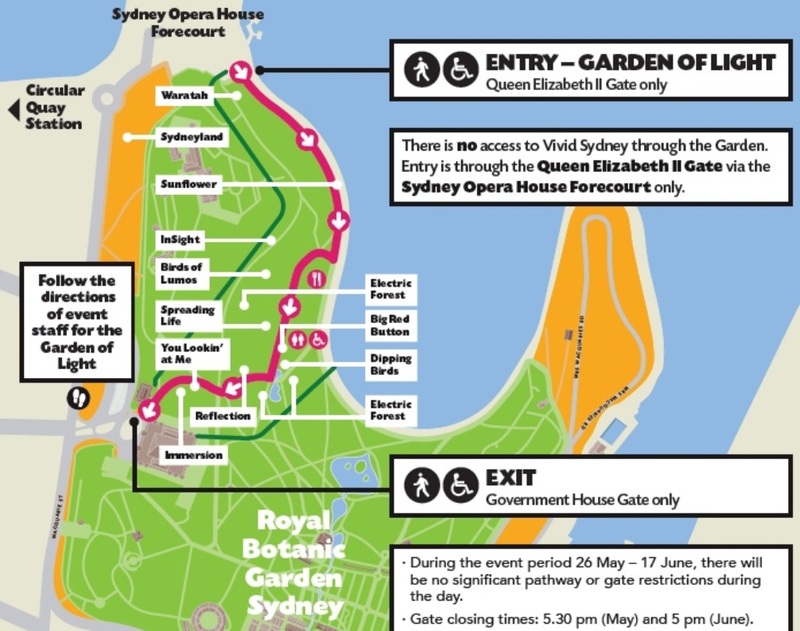 Entry is via the Queen Elizabeth II Gate on the eastern side of the Sydney Opera House Forecourt. Then, as you walk on into the Garden’s embrace, you are greeted by You lookin’ at me? : five big glaring eyeballs, scattered across the grass verge, behaving like watchful predators. Beware! If you come too close, they take action! 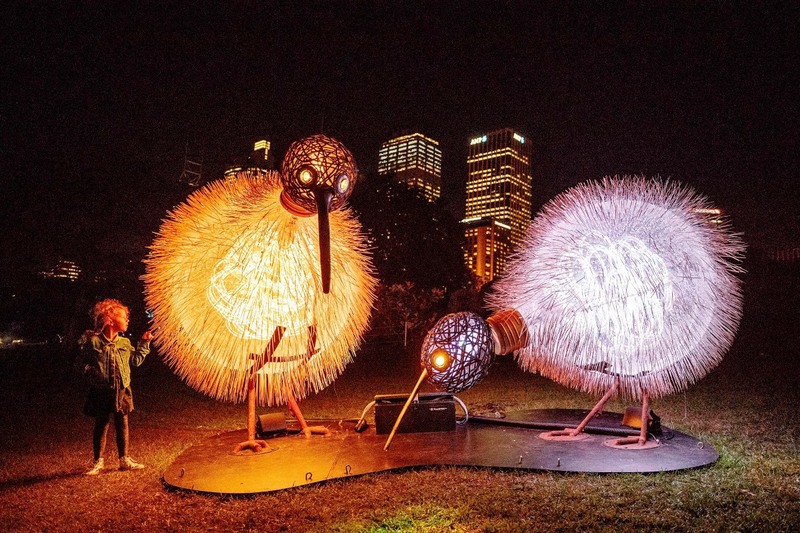 Along the way, Birds of Lumos introduce you to ‘Rowi’ — a rare species of Kiwi and her chick — they have the body of a light globe, beaks with nostrils and wear sight enhancing night-goggles. The Sunflowers is a joyous light sculpture that places large potted sunflowers along your route; they bow before you as you pass. 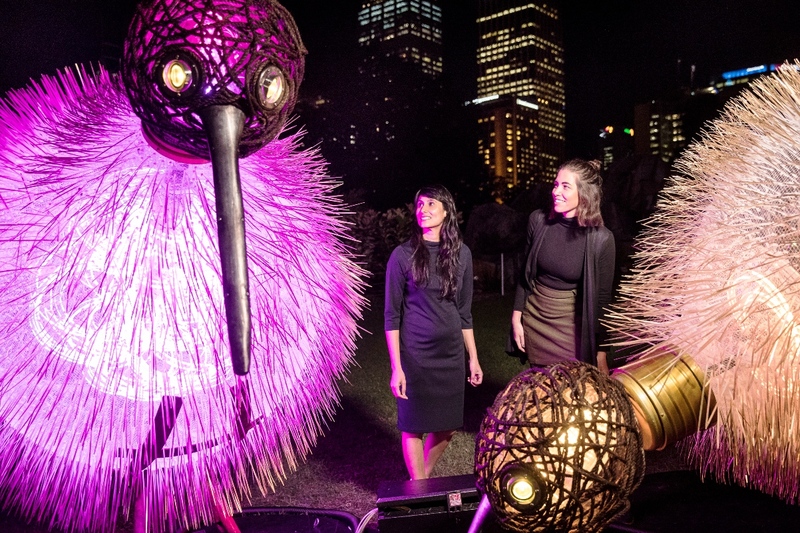 Electric Forest is a dynamic collaboration between Vivid Sydney and TAFE NSW, designed to highlight both the natural beauty of Sydney’s Royal Botanic Garden, and the talents of our next generation of Designers, 3D Artists, Animators and Electronic Musicians. 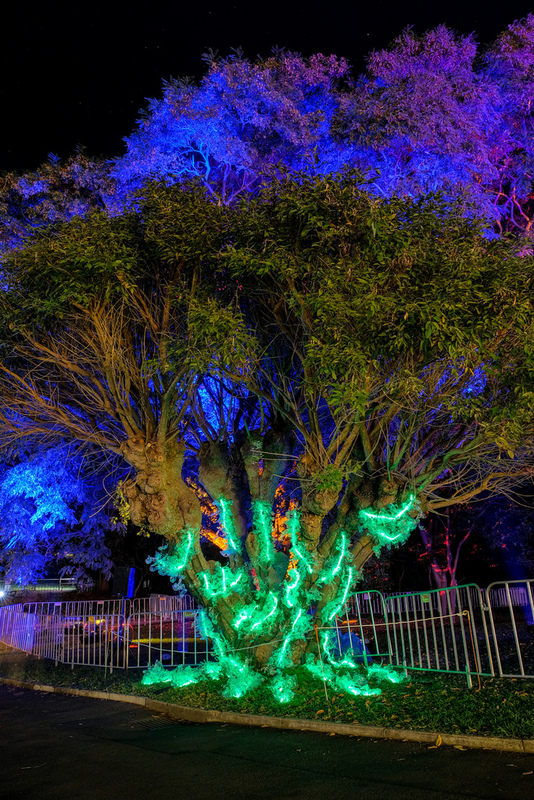 Two of Australia’s towering talents in Lighting and Animation, Mark Hammer and Nick Tory, have worked with the students to bring the Forest to life. 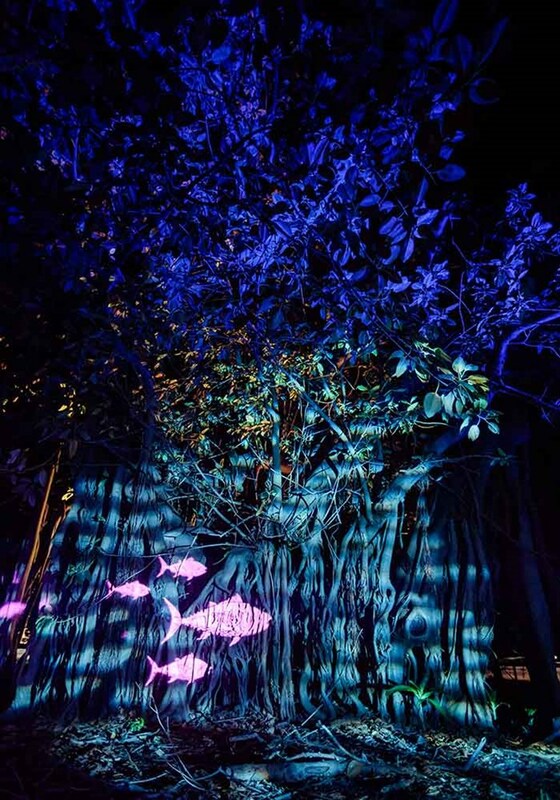 Visitors to the Electric Forest will walk through a strange world of illuminated plant life: from bizarre hanging ‘fruits’ and deep rumbling storms to schools of fish and cunning optical illusions, highlighting the fertile imaginations of the Live Production Design Students. 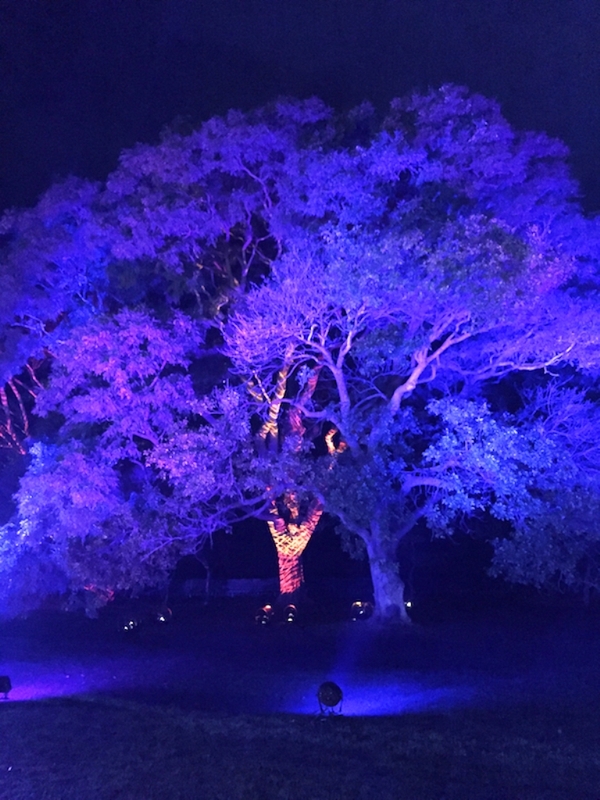 Electric Forest features music, lighting design, animation – and projection-mapping onto one of the Garden’s magnificent fig trees. 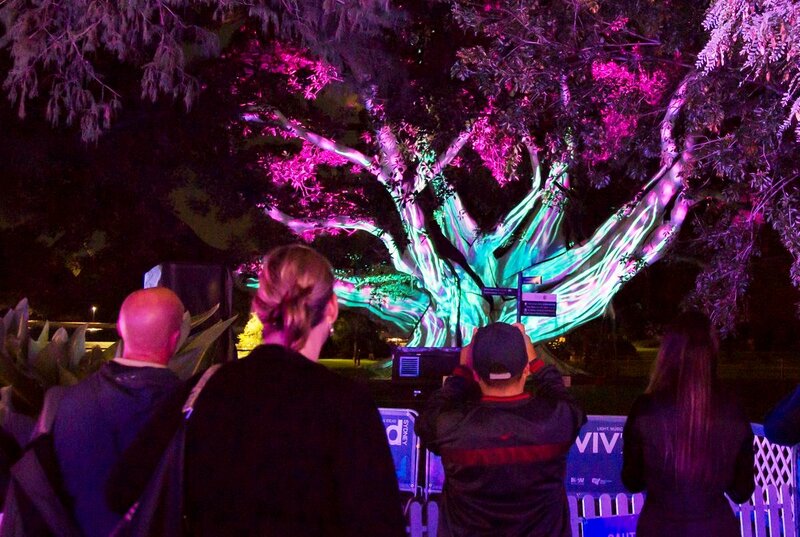 This projection transforms the tree into a canvas for TAFE NSW’s 3D Art & Animation students to paint and animate with light, while exploring the biology and ecology of the gardens. Finally, an unusual psycho-acoustic offering from the music students provides multiple soundtracks to the activation, so that when the animation loop repeats, it does so to different music. 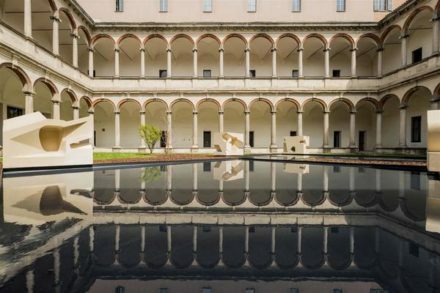 Apart from ‘keeping it fresh’, the audience will experience first-hand how different music can sometimes can change the entire meaning of a visual narrative. 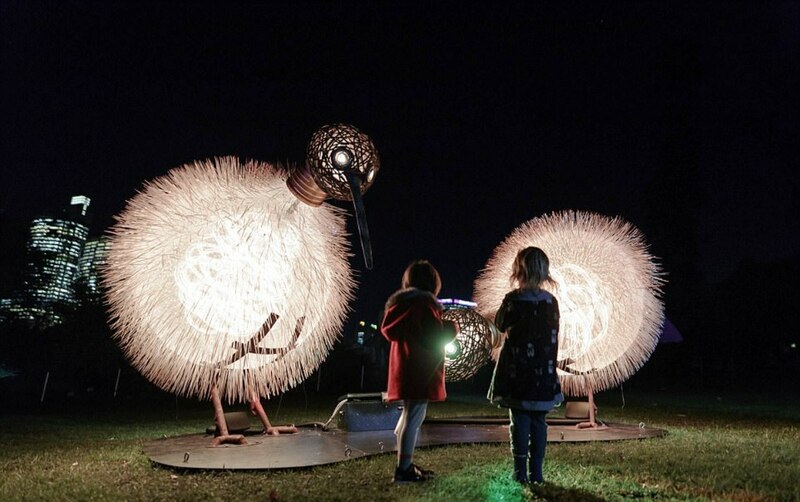 Birds of Lumos introduces us to ‘Rowi’ the kiwi and her baby chick; she wears sight-enhancing goggles – because unlike most nocturnal birds kiwi have very poor eyesight (although a keen sense of hearing and smell). 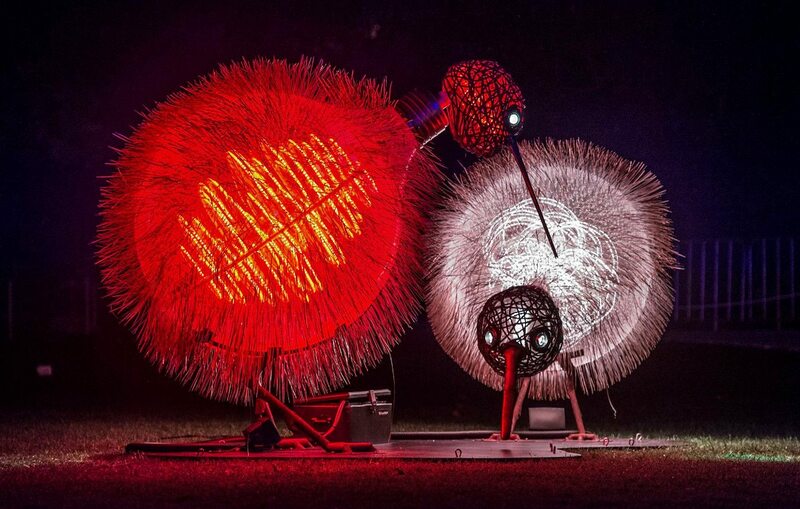 The artists, amigo and amigo (Simone Chua and Renzo B. Larriviere) have made these two little birds representative of the rare Rowi species of kiwi, and their work is a comment on the importance of conservation and the protection of wildlife. 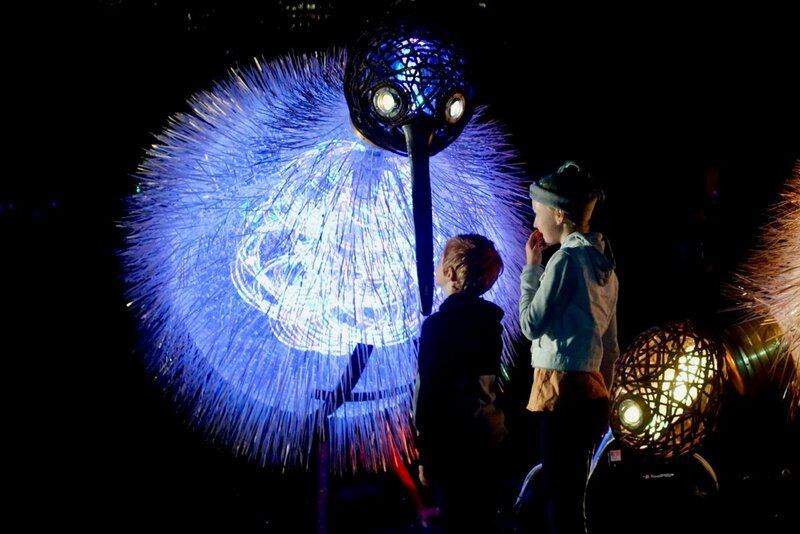 As visitors gather around them, Rowi and her chick come to life – glowing and pulsating different colours through their light-globe bodies. If Rowi senses danger, she will go through a ‘charge’ sequence; her glow will dim for a few seconds to ‘charge up’ and then illuminate in an intense display of light. The Rowi Kiwi does well to be wary of intruders because unfortunately 95% of kiwi hatched in the wild are killed by introduced pests and predators. The Rowi (one of five kiwi species) is highly endangered, with a population of just 450 birds remaining. 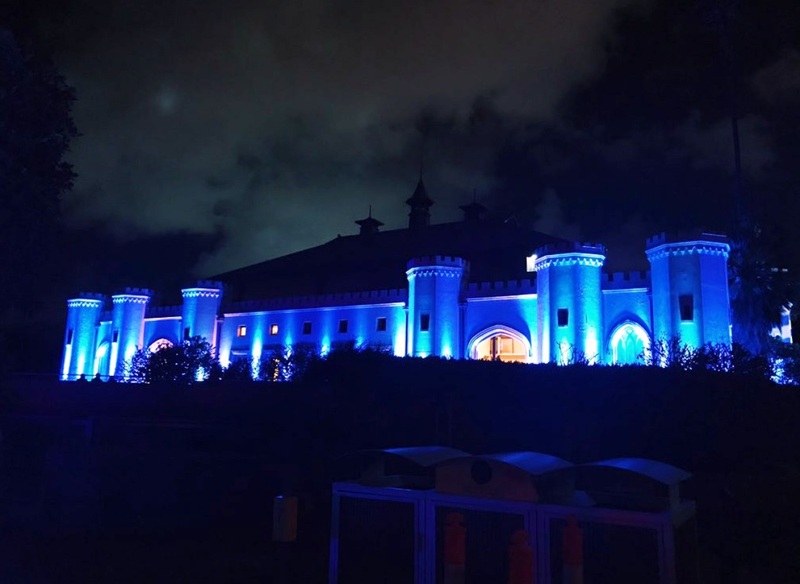 The NZ Department of Conservation, in partnership with Air New Zealand, relocates the Rowi Kiwi and other endangered species to safer new breeding habitats throughout New Zealand, paying great dividends to the environmental, economic and social well-being of the country. 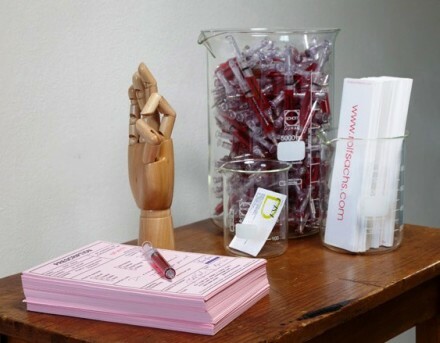 Artist: Lucka Slatner, in collaboration with Maja Knezev and Zarko Djekic. Dipping Birds is reminiscent of the ‘drinking bird’ novelty toy that so many of us loved all those years ago. You remember the one; a brightly coloured, spindly-legged toy bird that leaned forward, appearing to drink from a glass of water, then bobbed back up once its thirst was slaked. A few seconds later, down it went again. 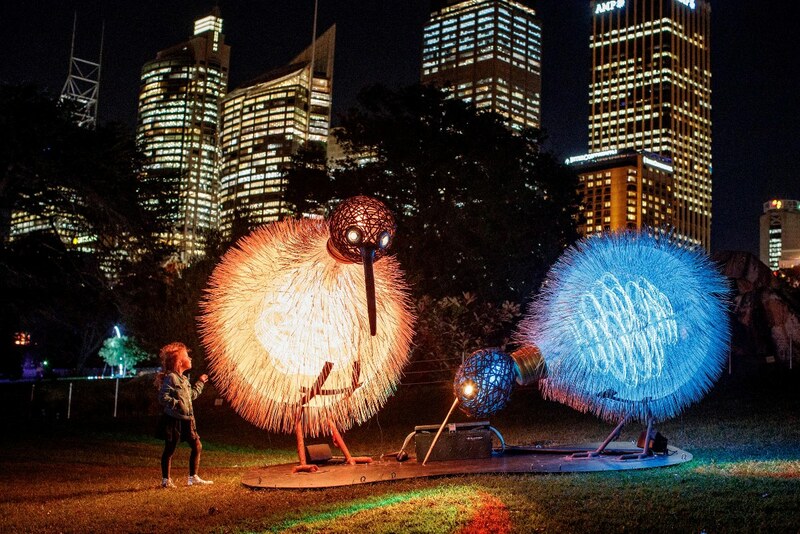 This installation – albeit on a much larger scale – is inspired by the toys that delighted and amazed generations. 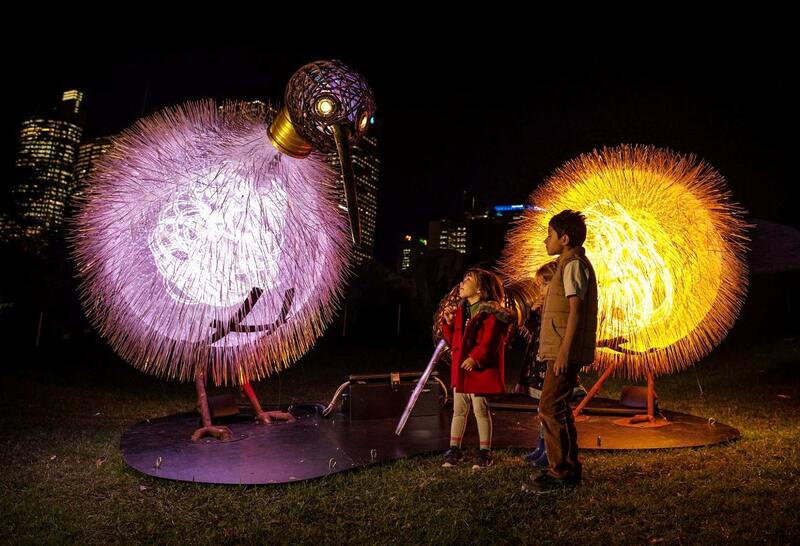 It comprises two large abstract birds, each over two meters tall, standing in a body of water. 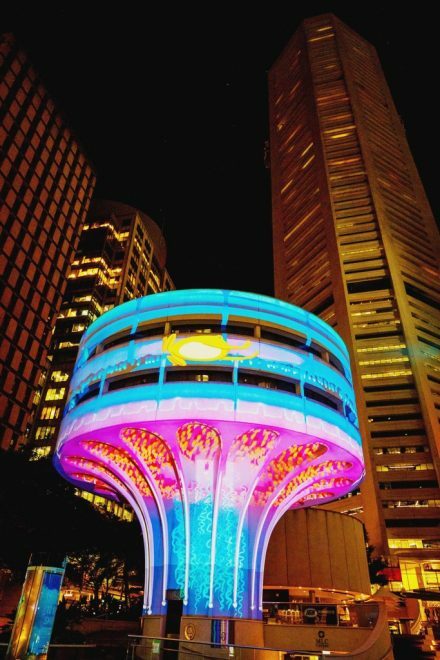 Both the birds and the water are lit with colour changing LED lights. As the birds dip their beaks into the water, they gradually change colour from head to toe, their hues altering to match the colour of the pond lights. After one bird has ‘soaked up the colour’ it straightens up, leaving the pond in a different light and the other bird repeats the action. The colour schemes constantly change and the bobbing of the birds and the gentle transitions of colour are hypnotic and delightful, refreshing and replenishing the child within us all. 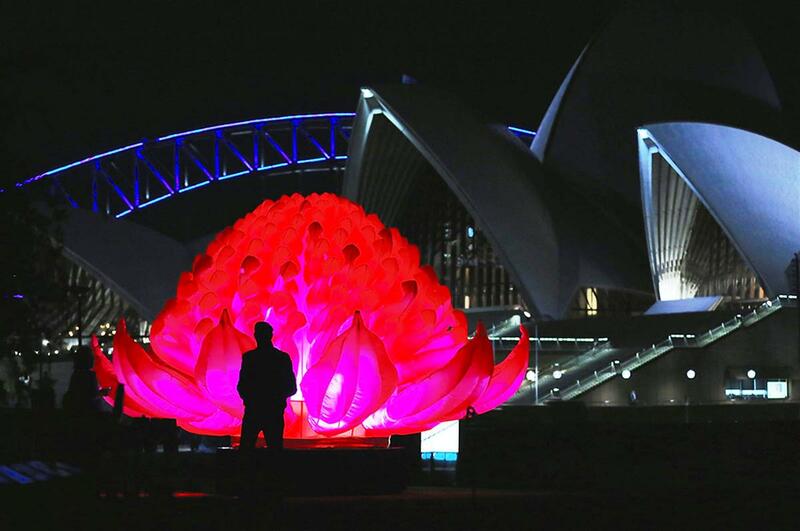 Waratah is a unique tribute to an iconic flowering plant. The majestic waratah is native to Australia and is the floral emblem of the state of New South Wales: it is difficult to cultivate and slow to mature, but flowers riotously in its native bushland setting. 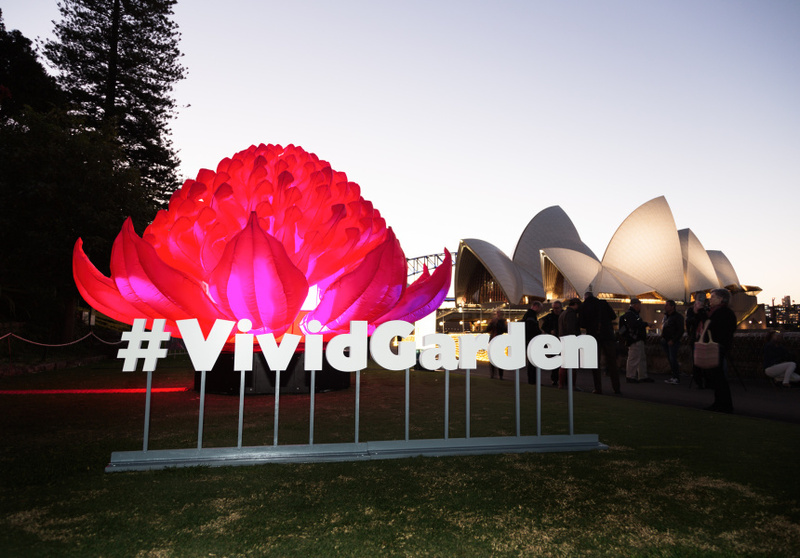 To honour this extraordinary plant, the artists have created a huge inflatable light sculpture, rich in colour and beautiful by day; at night it opens out to give visitors a larger-than-life experience of the aesthetics of this magnificent bloom. 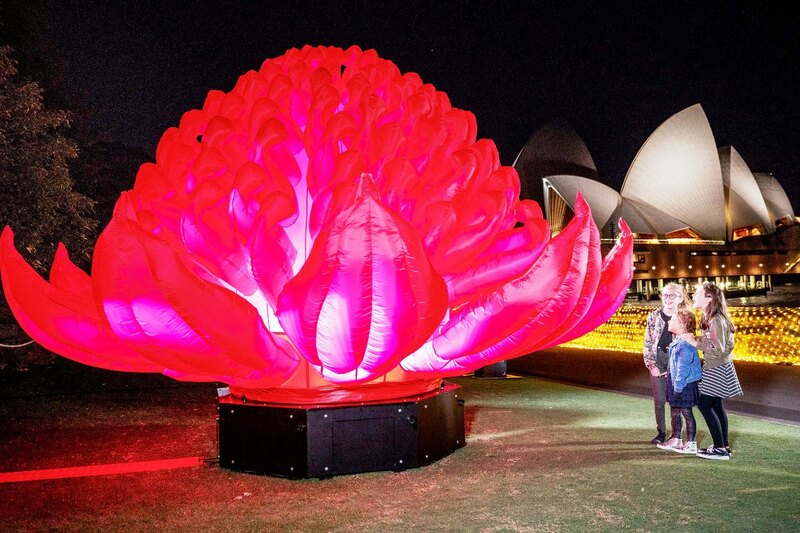 Waratah, like all flowers, is sensitive to its immediate environment: it responds to sound and movement, shifting from its ambient resting glow to an explosion of light. 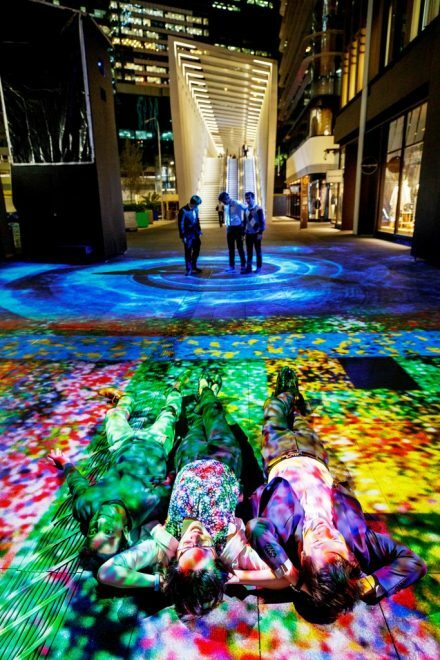 Visitors can walk right up to it and make direct contact and it responds playfully, creating integrated wave patterns with light. 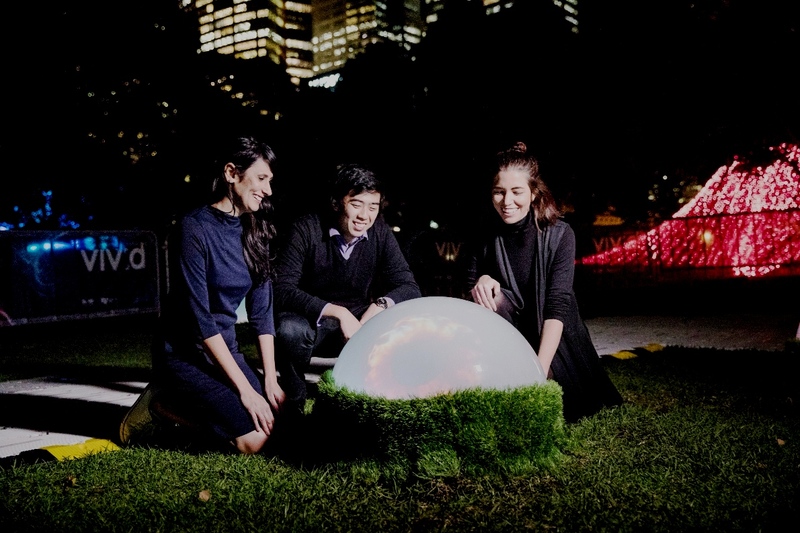 The interactivity built into the sculpture is inspired by scientific research that suggests that plants and their flowers are more like us than we think. 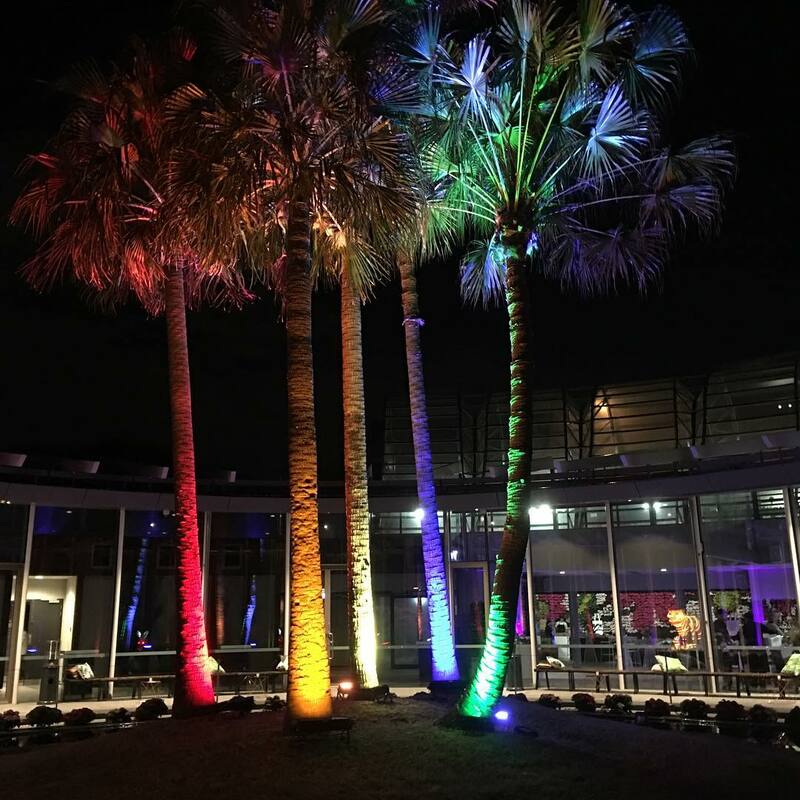 Just as humans respond emotionally to different types of contact or interaction, some plant specimens appear to respond to physical contact and sound. Different sensations can trigger a cascade of physiological and genetic responses; for example, some plants can ‘hear’ when insects are chewing them and release chemicals to stop the damage. Plants are also able to sense changes in their environment, and appear to communicate these changes to other plants via a subterranean ‘internet’ of underground fungus. 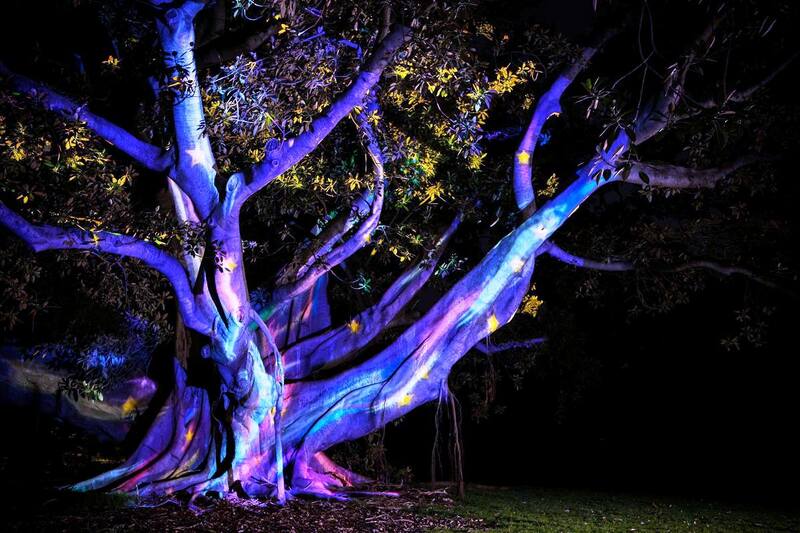 As they interact with Waratah, visitors not only celebrate the organic design of a marvellous work of nature, but experience a sense of that often-unseen relationship that exists between humans and plants. 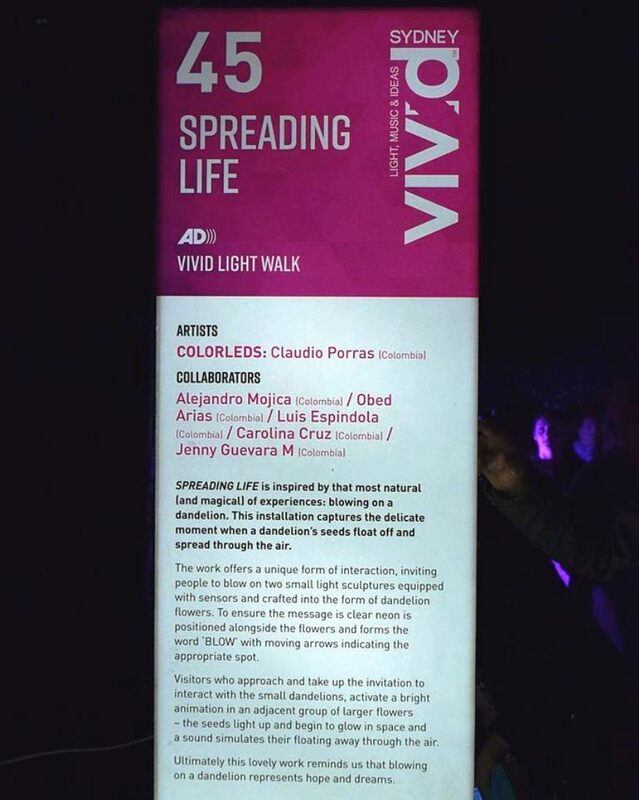 Reflection is a repurposing of those popular, decorative lightboxes that allow you to spell out your thoughts for the day by placing translucent letters on a backlit screen, reminiscent of an old fashioned movie billboard. This artwork adds an extra dimension to the idea, using reflection to spell out inspirational words. 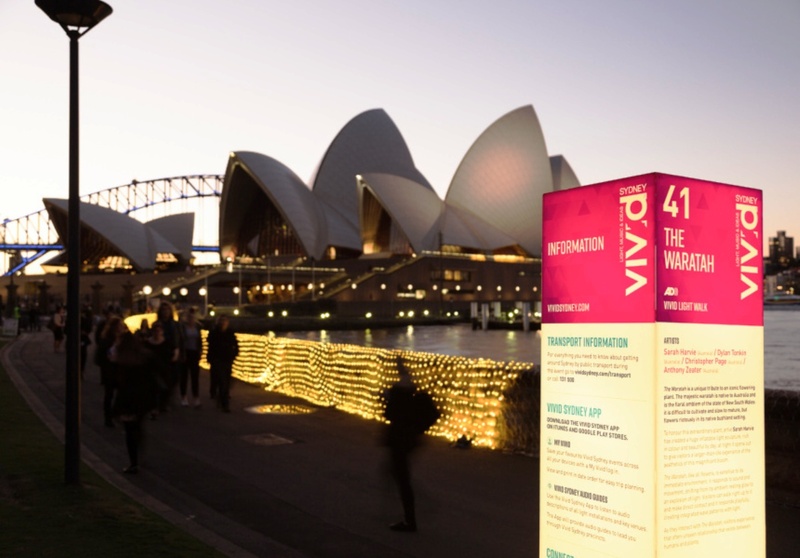 Horizontally and vertically halved letters on the light boxes are then mirrored to complete the image. 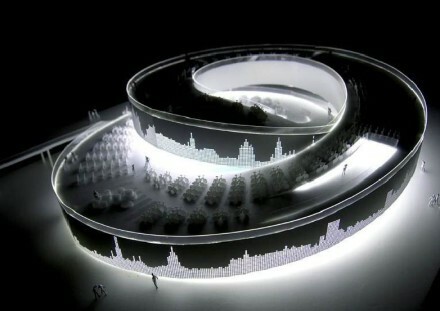 Depending on the viewing distance, it may not initially be clear what the message is, drawing the viewer closer. 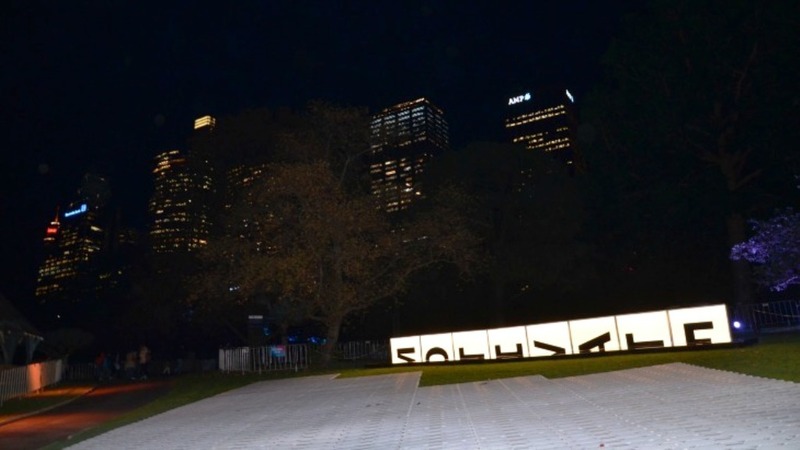 Then, as viewers move in and interact with the artwork, the entire words are formed. 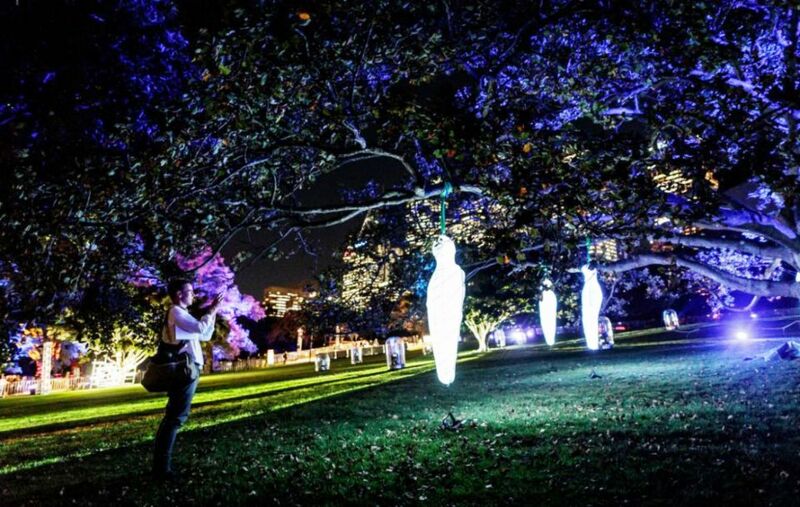 Inspired by Sydney’s ‘dream big’ attitude, the reflective aspect of the installation is both literal and figurative, aiming to inspire and engage participants to ‘reflect’ on their own hopes and dreams. 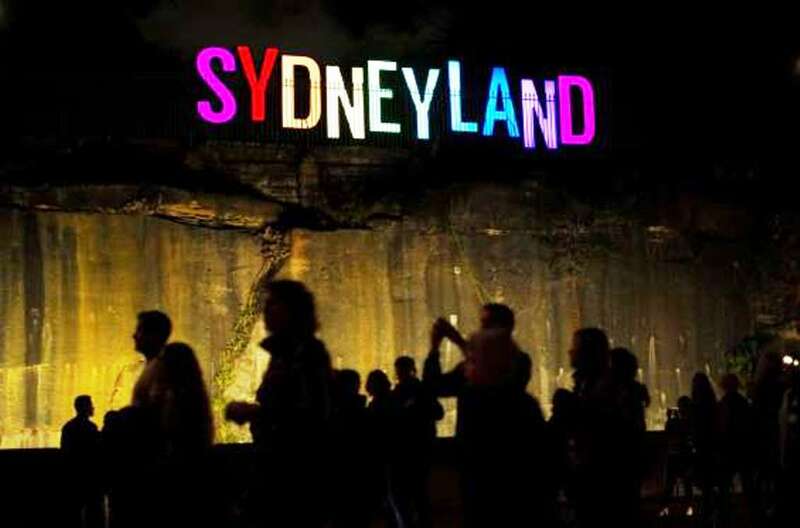 SYDNEYLAND spells it out in lights — bright, loud and fun, beaming across the harbour — 10 monumental illuminated letters, one word: ‘SYDNEYLAND’, for all to see. 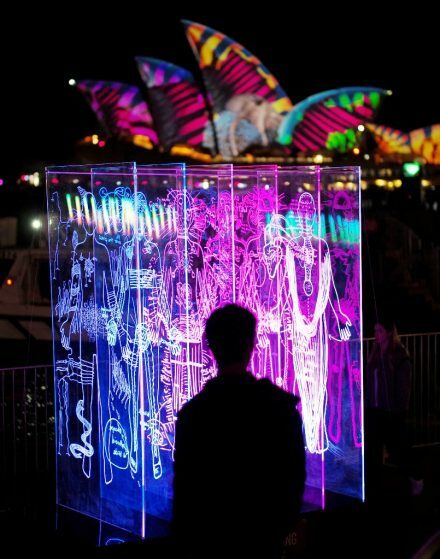 Each letter uses hundreds of pixel-mapped LEDs to create an evolving whimsical array of colour and light, each moment reflecting a little part of Sydney: from the sunrise over Coogee beach, to the sparkle of Mardi Gras, the kaleidoscope of street art in Newtown, and the twinkle of the city lights reflected in the water of Circular Quay. 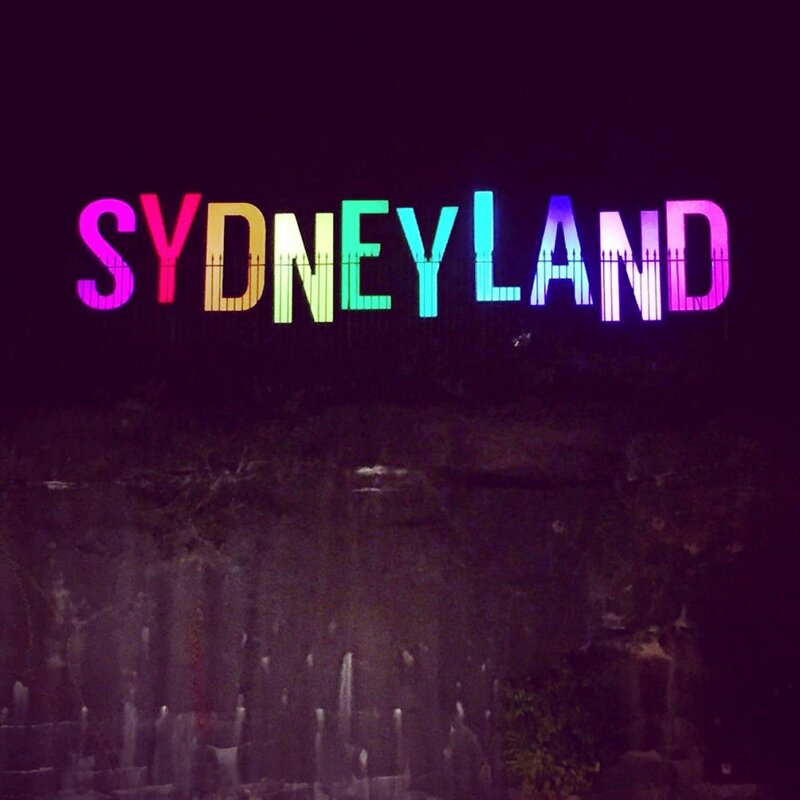 SYDNEYLAND is designed to engage with visitors through social media: a postcard snapshot and a geotag encourages digital interaction via Facebook, Instagram and Snapchat, allowing people of all ages to share the wonder that is Sydney. SPREADING LIFE is inspired by that most natural (and magical) of experiences: blowing on a dandelion. This installation captures the delicate moment when a dandelion’s seeds float off and spread through the air; a passage of nature – that shows us that as a flower dies, others are born. 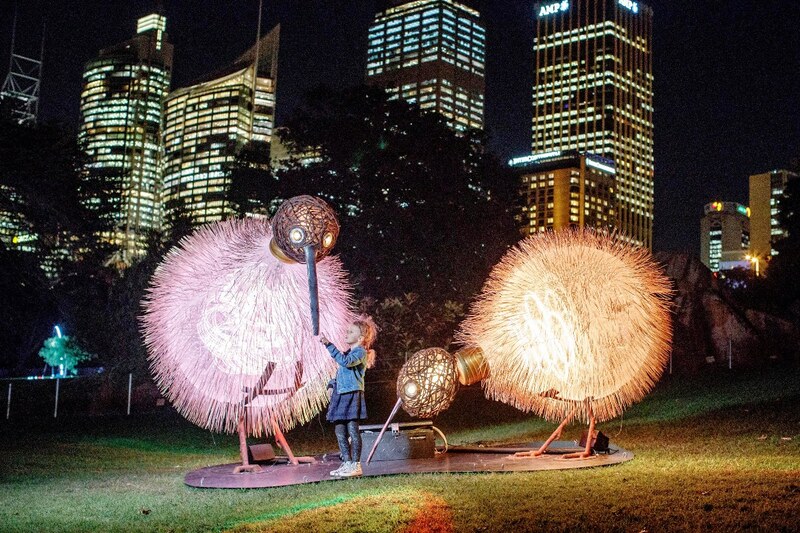 The work offers a unique form of interaction, inviting people to blow on two small light sculptures equipped with sensors and crafted into the form of dandelion flowers. 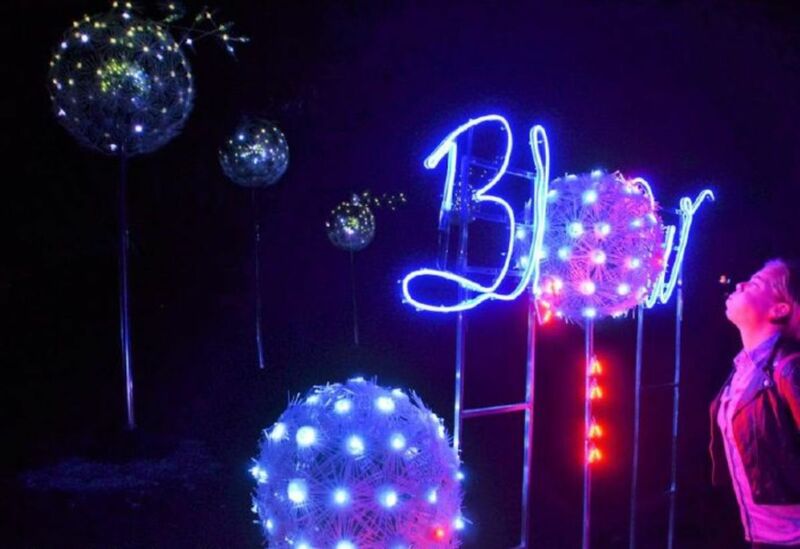 To ensure the message is clear, neon is positioned alongside the flowers and forms the word ‘BLOW’ with moving arrows indicating the appropriate spot. 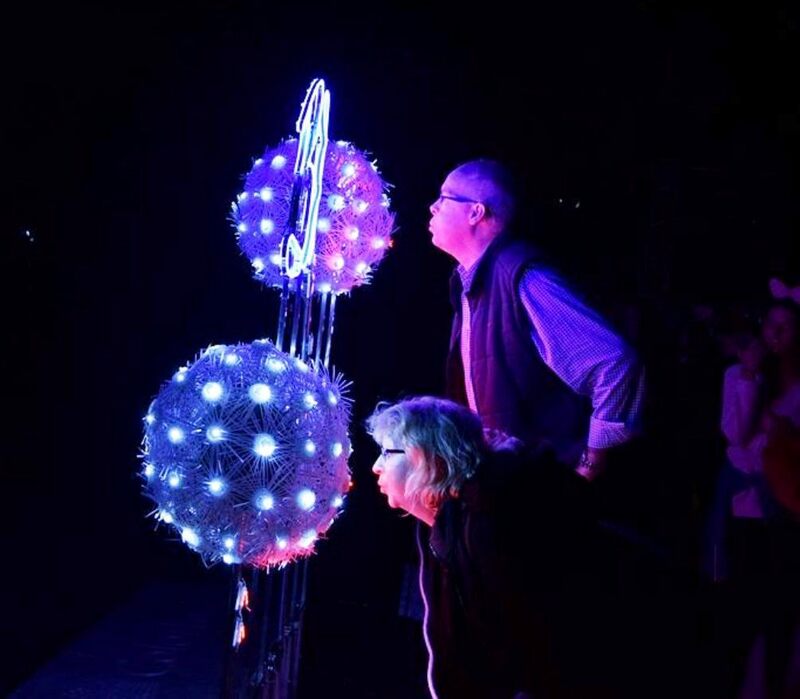 Visitors who approach and take up the invitation to interact with the small dandelions activate a bright animation in an adjacent group of larger flowers – the seeds light up and begin to glow in space and a sound simulates their floating away through the air. Ultimately this lovely work reminds us that blowing on a dandelion represents hopes, dreams and desires. You lookin’ at me? takes five big glaring eyes, scatters them across a grass verge and invests them with the behaviour of a watchful predator. 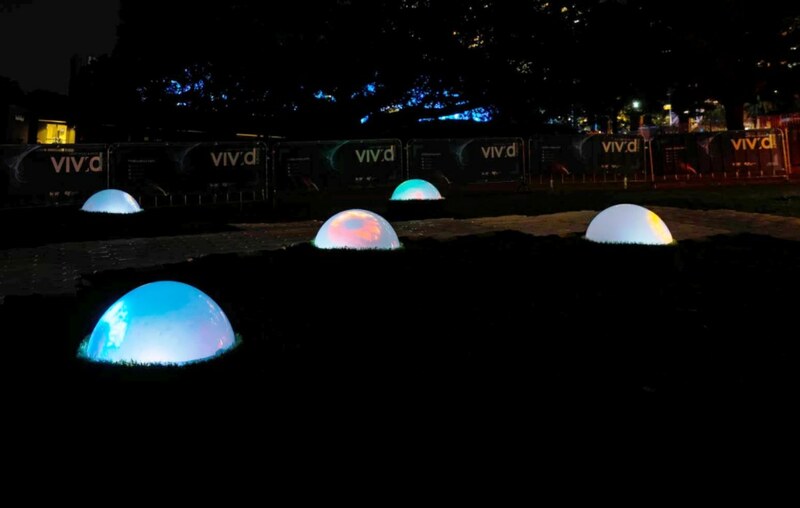 When undisturbed, the glowing, bulging eyeballs, complete with colourful irises, stare randomly, appearing a little bored; however, when a pedestrian passes they spark into action, each eyeball closely following the passage of the visitor. When there is more than one person nearby the eyes have to choose whom to follow or ignore. The general perception for the viewer: it is they who are being watched. Sometimes, when a visitor comes too close, the eyes become nervous and react by trying to intimidate the intruder with a lot of eyeball-rolling. If this fails to scare them off, the eyes might become bloodshot and angry and start to emit a swelling, sinister sound. If the eyes still fail to chase the visitor away, they simply give up. In a wink they turn into ‘eyes-wide-shut’, although some eyeballs may go into dignified denial and simply project a blank stare. 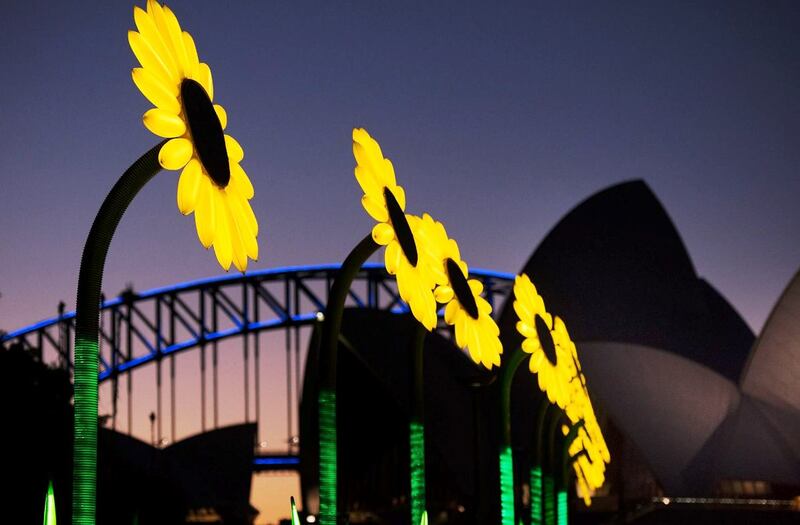 The Sunflowers welcomes each visitor with a bow – and in a most charming way introduces them to the potential of harnessing solar energy for a sustainable future. 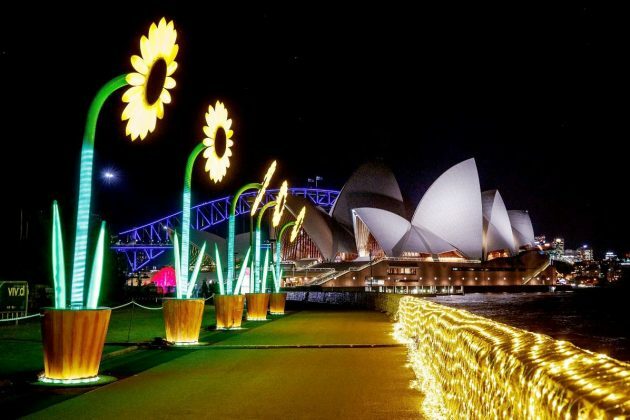 Solar panels harness energy from the sun during the day and store it in batteries embedded in the flowers: at night the stored energy is used to brighten LEDs in the petals and to facilitate the ‘bowing’ movement. In nature, sunflowers respond directionally to sunlight (this is also called heliotropism):a young flower faces east at dawn and greets the sun, then slowly turns west as the sun moves across the sky; during the night, they gradually turn back to the east to begin the cycle again. Sunflowers are loved by children and adults and are frequently associated with happiness, positivity and adoration: in Oriental cultures, sunflowers signify intelligence, strength, good luck and a long life. 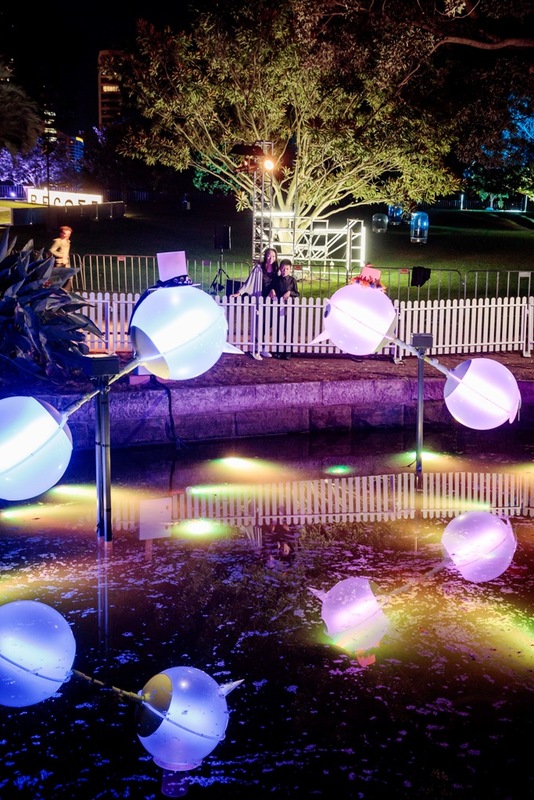 The Big Red Button is a playful interactive light sculpture that questions the impact we have on our environment and the efforts being made to reverse these effects. 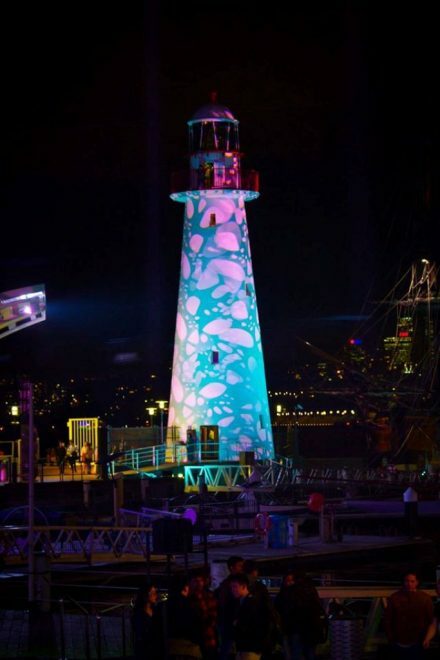 Curious festival-goers will no doubt press the button. 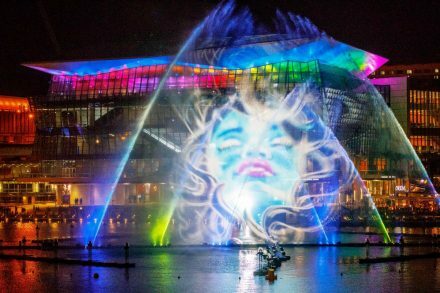 When they do, a projection mapping/sound design sequence is triggered and the bush bursts spectacularly into flames, burning until there is nothing left but charred black leaves and smoke. The smoking remains stay that way until another participant steps up to press the button – at which point the bush begins sprouting tiny green leaves, which gradually grow until finally the plant is healthy again. The Big Red Button creates a playful dynamic between those who want to see the bush burnt and those who want to keep it green. 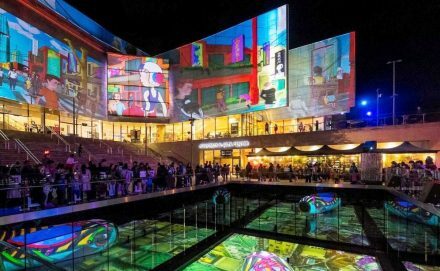 The work combines 3D projection mapping onto organic architecture with high-quality sound design; its aim is to promote deeper social interaction between festival-goers as they explore an issue of vital importance to the sustainability of our planet. 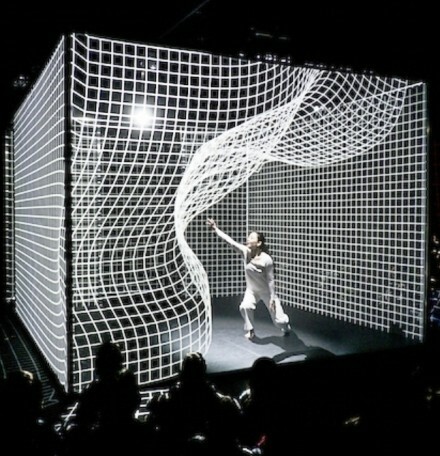 inSIGHT is a representation of the human face, rendered as a gigantic low-fidelity display. 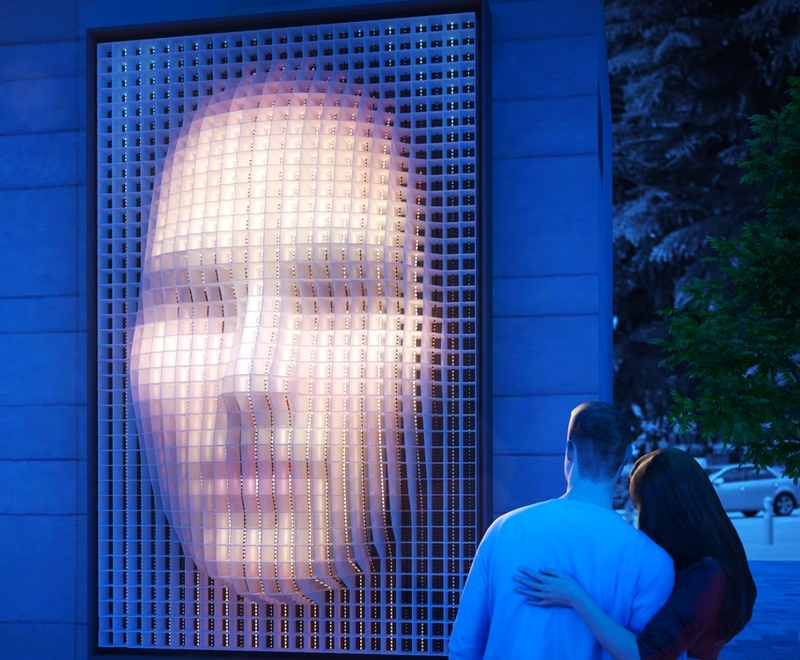 Translucent and illuminated from deep within, the sculpture stretches the scale of the pixels forming the image, but reduces their resolution. articulating and isolating the visual building blocks of the portrait.